Anyone who knows me well enough knows that I am a big fan of collecting gemstones. I incorporate gemstones with all my readings, and use them frequently as an aid with life situations. 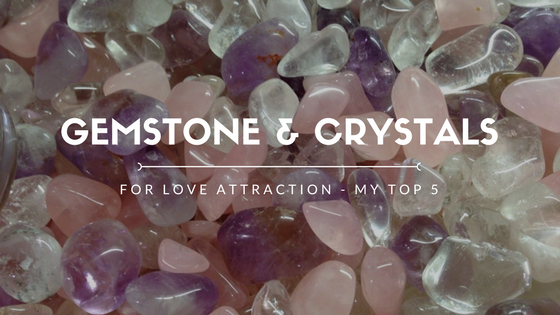 Here are my top 5 favorite gemstones that I have found to be the most useful in aiding with attracting love and romance into my life and have seen in others as well. I know they are so many more but, these are also my favorite because, they are easy on the pocket and you can find these basically at any place where new age products are sold. Here is some history on these love gemstones, they how to connect with them and the kinds you should have to attract romance and love into your life. Enjoy. Rocks, crystals, and gemstones have each held significant meaning for human beings since we first began attempting to control our surroundings, and create easier lives for ourselves. The more plentiful, and common minerals were widely used in everyday life for activities like hunting, cooking, and for protection; while more rare, and harder to find stones were highly revered and coveted for their qualities of mystery, and beauty. Since that time many gems and crystals have attained very specific qualities based on color, size, shapes and patterns. They have made their way into ceremonies, rites of passage, and all other manner of rituals designed to attract, or repel the unseen forces that affected our daily lives. Today, the most in demand gemstones, and crystals are the ones most closely associated with the powers of love. Whether you need to attract new love, strengthen existing Love, or even simply repair a broken heart, finding the right gemstone is key. Here are five of the best examples of gemstones, and crystals you can use to get your love life moving in the right direction. Small fragments of this beautiful crystal were first discovered during the time of the Incas, and are sometimes referred to as the “Inca Stone”. However, it wasn’t until around the late 1930’s when it was discovered in large quantities in Argentina that its popularity as a “Love” stone bloomed. More popularly recognized as the “Stone of Love and Balance” this talisman is used to heal the Heart Chakra so that it may easily receive and give love. Known as one of the most precious stones of the Orient, Green Jade has been a powerful influence in the lives of people all over the world. It is commonly accepted that Green Jade bestows blessings on anything it touches, strengthening love and happiness, and fortifying the physical body. Also, referred to as a “crystal of love”, green jade can be carried and stroked to support new love, increase fidelity, and create a strong bond of trust. Anyone who is uncertain about which gem they should carry to help guide their decisions in the ways of love should look no further than the Rose Quartz! Found in a wide spectrum of beautiful pink shades, this stone is considered the most useful, and infinitely powerful love stone one can carry. As it emits its unique message of unconditional love, and joy throughout the universe, it also brings a sense of healing and warmth to anyone who comes into its vicinity. Like the moon itself, this pale, yet elegant stone is another gem thought to bring powerful energy into the realm of love and passion. In ancient times it was thought that these mystical stones were actually created by the moon’s light solidifying as it fell to earth. Often associated with the more passionate aspects of love, Moonstone is best used to its full potential by fanning the flames of desire in the bedroom. Also known as Lodestone, the unique magnetic qualities contained in this mineral give it exceptional power in attracting those things we most desire in life, including love with the right person. Though not quite as stunning in appearance as many other love stones, its strong magnetic pull, and impressive ability to balance the mind and body make it a must have for anyone who wishes to cultivate a relationship based on commitment, and love. When choosing the right gemstone to increase your chances for love, another option to consider is to combine various gemstones and crystals based on their unique qualities. The union of one or more sympathetic stones can be used to create more specific results, or just to increase the vibrations, and power within the stones themselves in order to send your unmistakable message of love throughout the universe loud, and clear! Another way to help attract romance into your life is by connecting with a spiritual advisor such as myself who can perform a reading which investigates your situation, points out the obstacles and gives your a spiritual solution to your problem. We can see which Saint will work on your behalf and/or what spiritual work you can personally do yourself to aid in attracting you-you’re perfect match. You can book a readings session with me HERE and receive $10.00 off your reading.